Relocation America International is proud to sponsor another successful event on April 11, 2019 as human resource professionals from across Michigan gather in Lansing for the 10th Annual Michigan HR Day! Michigan HR Day is an opportunity for all human resource professionals in Michigan to meet and exchange information, ideas, and experiences. Positioned at a critical time for Michigan organizations, the event addresses the relevance of the HR function as an important part of Michigan’s economic gardening and revitalization. Michigan HR Day welcomes HR professionals from diverse Michigan organizations a true reflection of the State’s business environment and culture. Attendees will also be offered the opportunity to earn HR Certification Institute (HRCI) re-certification credit hours and Society of Human Resource Management (SHRM) continuing education re-certification credits. This entry was posted in Relocation on March 12, 2019 by reloamerica. We just received the following update from Atlas International, one of our international freight forwarding partners. Since delays affect transit times which in turn have the potential to impact temporary living/storage costs we believe it’s important to keep our clients fully informed. Carriers are now seeing higher volumes of cargo being shipped which is causing port congestion. As a direct result, household goods cargo is arriving one to two weeks later than previously scheduled. This port congestion is affecting Europe, Asia and South America. We advise adding a minimum of one week to international transit times. In addition we are also seeing carriers booked out two to three weeks for cargo exiting the United States. This entry was posted in Relocation on March 8, 2019 by reloamerica. In a recent Business Travel News Survey 73% of respondents waited, on average, five weeks to be reimbursed by employers for business related expenses. Not only is this an annoyance for employees, but it also has the potential to place a burden on talent management and retention. While relocation expense reimbursement can become a source of frustration among transferring employees, there are a few simple steps that can be taken to make the process more efficient and successful. Mobile Technology: One of the best practices with respect to expense reimbursement is to ensure your relocation service provider has an easy to use mobile app that allows transferring employees to quickly request reimbursement of eligible expenses at any time no matter where they are (even if on a home finding trip). The ability to check the status of reimbursements also gives employees some visibility into the reimbursement process which makes it easy and painless. Our own app, RA International Connect, offers an intuitive and friendly interface that features tools designed to support transferring employees throughout the entire relocation process. 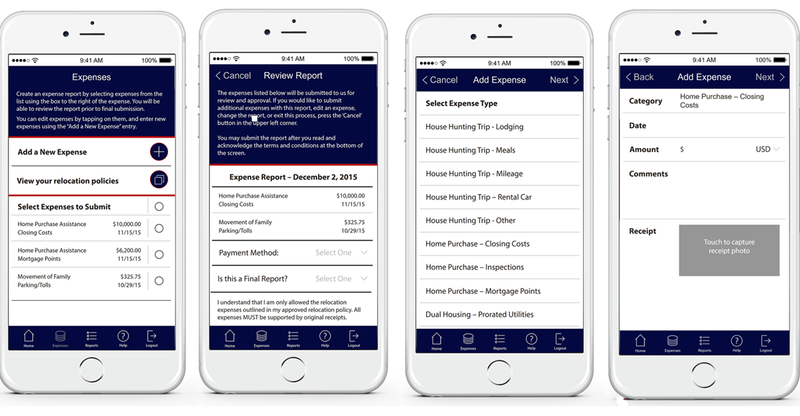 Among the many features included in RA International Connect is the ability to process expense reports and submit receipt photos via the smartphone’s camera. Urgent Reimbursement Requests Be sure to partner with a relocation service provider that has the financial wherewithal to process reimbursements weekly or biweekly if needed. If your transferring employees need to wait up to 3 weeks for reimbursement funds to arrive because your relocation service provider has funding issues then service levels will suffer and frustration levels with the relocation process will rise. Here at Relocation America International we have the ability to process expense reimbursements the same day we receive them if necessary. From our experience the immediate turnaround time we provide adds to the positive experience our clients have when working with us. Utilize ACH direct deposit or Wire Transfers: Automatic clearing house or ACH reimbursements allow for direct deposit of employee reimbursements and allow transferring employees immediate access to their funds eliminating the need for paper checks which delay the reimbursement process. Consider the use of lodging and meal per diems as part of your relocation policy. Begin by understanding your client’s goals and travel needs and consider using per diems to control expenses. Per diems allot employees a fixed amount per day reducing the need for transferring employees to save purchase receipts. As long as the cost is under the per diem amount, it’s approved without the need for documentation. The biggest advantage of per diem use is it allows for predictability in travel budgeting. Increasing the ease and timeliness of relocation expense processing can result in cost savings and increased transferring employee satisfaction. Choosing the right provider who has the right tools to manage this process on your behalf can make all the difference in the experience your employees have when relocating. Relocation America International is a full service relocation management company headquartered in Southfield, Michigan dedicated to providing innovative relocation services, value added support, and superior service to clients relocating families domestically and internationally. Visit http://www.rainternational.com for more information about our services or contact us at mobility@rainternational.com. This entry was posted in Hot Topics on February 9, 2019 by reloamerica.